Throughout our region, residents rarely think twice about turning on their taps and receiving clean water to drink, clean, and cook with. The Delaware River Watershed alone provides clean water an estimated 13.3 million Americans, roughly 4 percent of the U.S. population. Unfortunately, clean water protections are threatened by the current Administration’s proposed redefining of the Waters of the United States rule under the Clean Water Act. Take action by midnight on Monday, April 15th to speak up against weakening the Clean Water Act! The main goal of the Clean Water Act is to restore and maintain the integrity of our nation’s waterways by eliminating the discharge of pollutants into the nation’s waters, and to achieve water quality levels that are fishable and swimmable. In 1972, the Act established a structure for regulating pollutant discharges and provided the Environmental Protection Agency’s (EPA) the authority to implement pollution control programs such as setting wastewater standards. In 2015, the Obama administration extended federal protections for small streams and wetlands that flow into larger waterways, such as the Delaware River and Chesapeake Bay. Protections include limiting the use of pollutants like chemical fertilizers that could runoff into smaller waterways. Now, the Trump Administration’s proposed rollbacks would leave waters without guaranteed protection under the Clean Water Act’s pollution control, prevention, and clean-up programs. 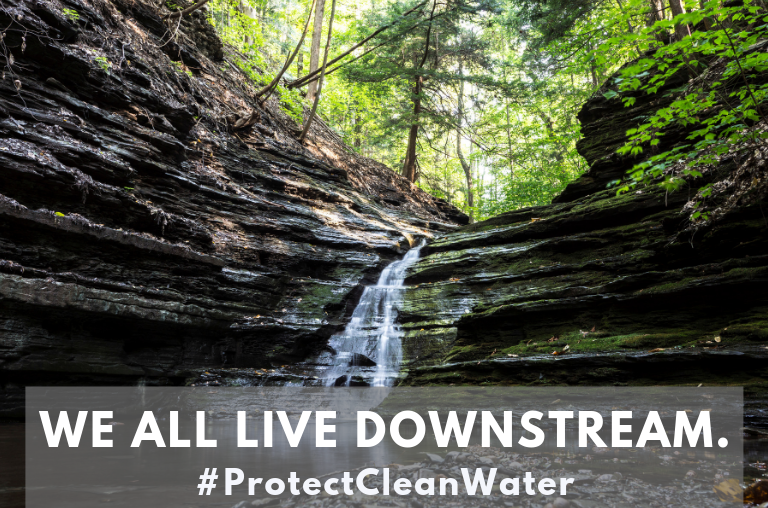 By the EPA’s own estimate, protections would be removed for 18 percent of our nation’s streams and 51 percent of wetlands, which are critical for wildlife habitat, mitigating flooding, and pollution control within the Delaware River Watershed. Wetlands, in particular, filter out sediment and other contaminants in polluted stormwater runoff and provide habit for a variety of plant and animal species, like the endangered bog turtle. Over-development and loss of habitat are critical threats to the Delaware River Watershed, which includes portions of New York, New Jersey, Pennsylvania, and Delaware. As more development encroaches on land, less water can seep into the ground, resulting in flooding, water pollution, and property damage. Proposed changes to the Clean Water Rule (more like “Dirty Water Rule”) would rollback regulations from the watershed’s valuable filtration and floodwater buffers. This is a dangerous backpedal for clean water protections. The passage of the Clean Water Act served as a response to the growing environmental movement alongside scientific advances and troubling events that boiled up to the attention of national media. Before the passage of the Act, portions of the Delaware River could barely sustain aquatic life. Sewage and other waste pollution from slaughterhouses and chemical plants dumped into rivers caused bacteria to breed at alarming rates. The lack of oxygen in the water had detrimental impacts for fish and other wildlife species. One story from pre-Clean Water Act times claims that the odor of the Delaware’s contaminated water could be smelled from an airplane high in the clouds. To date, significant progress has been made in cleaning up many of our nation’s most treasured rivers which depends on the small streams that flow into it and on the wetlands that buffer it. Waterways previously avoided are now valuable assets for education, recreation, and business within New Jersey. Over 40 species of fish now call the Delaware River home, including the endangered Atlantic Sturgeon. Fishing, paddle boating, kayaking, and river tubing have become popular activities on the water. Protecting our clean water resources also makes good economic sense, creating about 600,000 jobs. Now is the time to make our voices heard. We cannot step back in time while so much depends of clean, healthy water. Please submit a public comment to the EPA by April 15th on Docket ID No. EPA-HQ-OW-2018-0149. Tell the EPA that you oppose the “Dirty Water Rule” and urge the rejection of regulatory rollbacks for waterways protected from pollution under the Clean Water Act. Act now to protect the future of our watershed for people and wildlife. TAKE ACTION BY MONDAY, APRIL 15th at MIDNIGHT!